Over the last five years, more than 60 cities in Iowa have struggled with high nitrate levels in their drinking water, and 30 percent of Iowa’s municipal water systems are at high risk for nutrient pollution. High nitrate levels in drinking water are a considerable public health risk, and studies have linked elevated nitrate levels to bladder cancer, thyroid cancer and birth defects. Despite the risk, many smaller facilities don’t have nitrate removal equipment to use when levels rise. To mitigate the damage, drinking water authorities can sue counties that manage upstream drainage districts (as Des Moines did in 2015) or construct new treatment infrastructure. Both of these options are prohibitively expensive. Communities in northwest Iowa source their water from groundwater aquifers which are often overlooked when considering the impact of nonpoint source pollution. The Iowa Department of Natural Resources (IA DNR) has modeled “capture zones” around public wells to indicate the areas where the water from the surface recharges the aquifers the water is drawn from. Within these capture zones a large percentage of the land is in agricultural production. Since nitrate contamination is often linked to the over application of fertilizers and animal manures and lack of winter cover crops on private lands, facilities can significantly reduce the risk of nitrate contamination and the cost of water treatment by development and implementing a Source Water Protection (SWP) plan. Through these plans, facilities can work with local agricultural producers to address nonpoint source pollution in order to protect source water as well as the surrounding watershed. Participants were very engaged and focused throughout the event. Everyone who attended mentioned this was their first time thinking about communications specifically and were excited about applying these lessons to their own source water protection plans. The workshop was also a great opportunity for the communities to network with one another. Although all are facing similar struggles, these communities don’t often get to meet, share knowledge and build relationships. All three communities pull water from alluvial aquifers, which are generally shallow sand and gravel deposits. This particular aquifer has no confining layer, which means it is highly susceptible to surface contamination. The city of Holstein’s drinking water has a nitrate level around 6 milligrams per liter. The city of Kingsley’s water has a nitrate level slightly above 6 milligrams per liter, and the city of Ida Grove’s nitrate level is a little over 4 milligrams per liter. These three cities have developed and are implementing source water protection plans to increase the use of conservation practices that address nitrogen losses from agricultural and urban sources. Lewis Byers and Practical Farmers of Iowa cover crop champion Jonathon Kiel joined the workshop for the last hour and shared their experiences with conservation on their farms. Each farmer talked about their history with conservation and how they farm. The city participants were very interested in their stories, and had lots of questions about the best way to approach farmers in their areas. Both Lewis and Jonathon were able to provide detailed specific suggestions to each community about good first steps for farmer outreach. Both farmers have been using no-till and cover crops to improve the conservation of their corn and soybean systems. Cover crops helps improve soil tilth and reduce the amount of nitrogen that leaves a field in the off-season when no living roots are typically growing. The Iowa Nutrient Reduction Strategy Science Assessment shows that practices with a living root in the group year-round have a large impact on reducing nitrogen and phosphorus loss because they hold nutrients on a field. Fertilizer management, indicated as MRTN on the graph below, at best improves water quality in single digits while living roots in the ground year-round improve water quality from 30 to 90 percent. 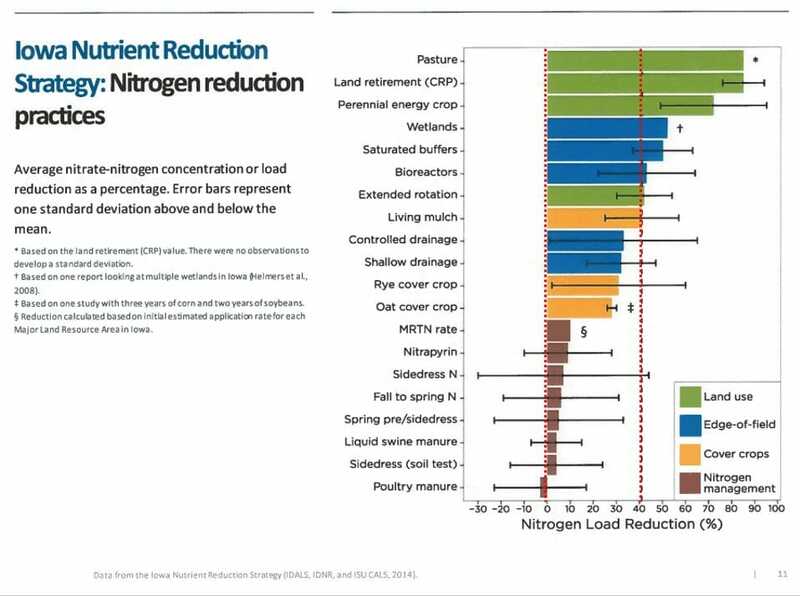 Starting with fertilizer management is important but needs to be combined with other practices from the practices highlighted in green, orange and blue (NRS graph). 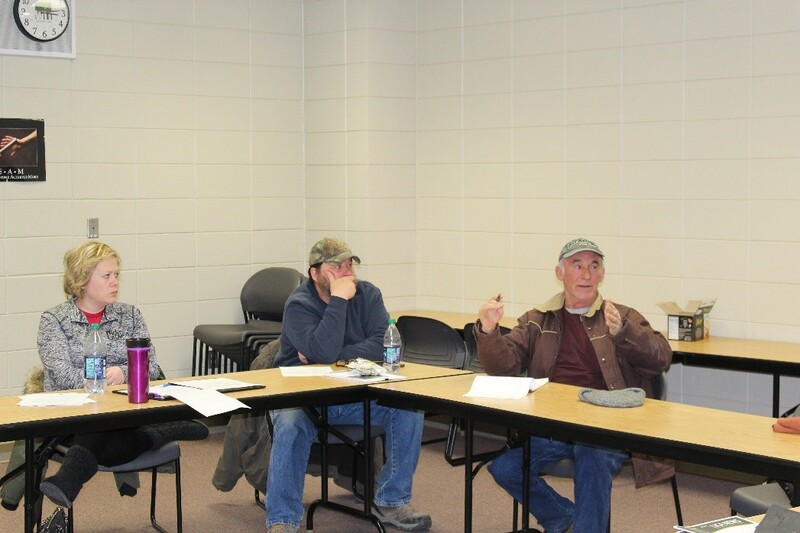 The workshop was a great opportunity for community members to build relationships with one another, learn from local farmers and learn about how to effectively engage farmers and the public on source water protection issues.